Average Height	: 25" - 27"
Average Weight	: 80 - 100 lbs. There is almost no mistaking the Komondor for any other breed. The Komondor is a massive dog with a proud gait and a long history of honor and pride. The Komondor worked with the Puli in ancient Hungary. The Puli would do the actual herding during the daylight hours, and the massive Komondor would guard the flock at night. 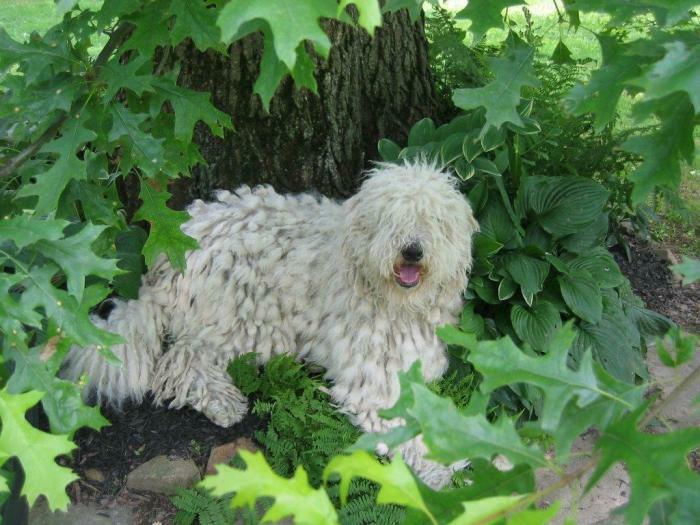 The Komondor is completely covered with an extraordinary felted and corded coat. The coat can run from 8 to 11 inches long and is one of its most unique features. This coat is always white. Some people believe that this corded white coat helps the dog blend in well with the sheep that they guard. It has also been thought that this unique coat add protection to the animal. The Komondor has a long history and some of that is intertwined with the Puli breed. It has been asserted that the Komondor is descended from Tibetan dogs. Some researchers believe that the Komondor was brought to Hungary more than a thousand years ago by nomadic Magyars. These hearty dogs were used to guard flocks of sheep during the nighttime hours. Because of their willingness to protect the flock and the owner against any threat, big or small, they were highly prized among the shepherds. Some newer research is suggesting that they came from the Cumans. The name, Komondor (they propose) came from the name, Koman-dor, which means dog of the Cumans. To give you an idea of how ancient this breed may be the earliest written reference to the breed is from the 16th century. During the ages since it has been used as a reliable and loyal guard dog. Beginning the 1920's the breed began to show up in dog shows. It has since gained a wide popularity with owners the world over. Even today the Komondor is often used as guard dog for livestock. People who are unfamiliar with the Komondor should spend some time researching the breed and then visiting with a live Komondor before purchasing one. The reason for this is that the Komondor is a serious, confident, and commanding breed of animal. For the most part, it can be very reserved with strangers and will size up any stranger who happens to be in the vicinity. The Komondor is very territorial and it will protect the owner and the owner's property without hesitation. It is good to remember that this breed has fought wolves, bears, and many other predators when it was used a guard dog in times past. That same willingness to get into a fight is alive today. also with people. Anyone considering this breed as pet, must understand that the Komondor needs to be thoroughly socialized with people and other dogs at an early age. The serious temperament of the breed is one of the most important aspects of the animal that perspective owners must consider. Even with the best of training this breed can and does often react from instinct. This can cause serious problems for some owners. You should only purchase a Komondor if you are willing to invest in the obedience training that it will need and if you are willing to be somewhat "on the edge" as far as safety is concerned. As with many breeds of dogs the Komondor is prone to hip dysplasia. This is a breed that is also somewhat prone to Bloat. It is very important for all owners to understand that the coat and hair of this breed should never be brushed. It must never be combed either. The hair of this breed is divided into cords and those cords will need to be separated by hand. The Komondor will require bathing and it should be noted that this bathing can be a laborious process. The drying time for this breed can be up to two days if it is left to air dry. The animal does not shed much if any at all. Baths should be given only when needed. The Komondor is a medium level exercise breed. For the most part it will exercise itself if it has enough room to do so out of doors. It is important to ensure that the dog cannot get lose as it may attack other dogs, animals, and people that it feels are a threat. For walking, the Komondor is very energetic and will happily take long walks with the owner. The animal is not exactly a playful breed, but it is a loyal breed and will attend to the owner's wishes when trained properly at an early age. It should also be noted in that some Komondors are very lazy and will be more than happy to lie and nap for hours and hours. In an otherwise healthy animal, this should not cause alarm or concern. This breed requires training and there should be no getting around that fact. They need complete and firm obedience training by an experienced owner or from a professional trainer. The breed can be very willful and must be taught who is the master. Because of the chance that it might attack other animals and people this training should be started very early on and it must be reinforced during the life of the animal. This breed is very smart, but it can be easily led to boredom. For this reason it is always a good idea to have something for the animal to do or to play with. The breed enjoys learning new tricks and will usually try very hard to please the owner. Many owners will attest to the fact that this breed can be very loyal to the owner and the owner's family. The breed is known to show respect toward those who own it. However, it should not be forgotten that this dog can become very aggressive when it feels that there are threats nearby. Proper obedience training can go a long way in solving this potential problem but owners should never let their guard down when there is the possibility of trouble. trained thoroughly, and raised with children from the start, but they are not recommended for most families, especially those with small children or for owners who already have another animal in the home. Older dogs will have their own mindset and may not be as trainable as 1st time owners with this breed. In addition, they will be much harder to accept the other issues that may be a part of the home such as children and other pets. When training is started early, the breed can become a very good family pet, but that training must start as soon as possible and it may best be conducted by a professional trainer.